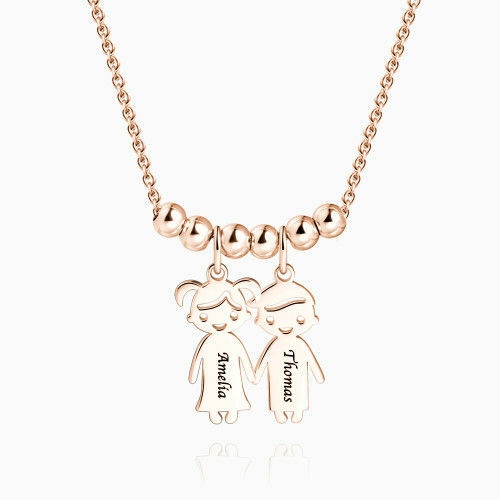 This beautiful handmade boy girl necklace gives you the memory about all the joy and love with them. Whether you engrave it with memories or give it as a gift to your mom, you can select to personalize names on the front. When purchasing this product, select from classic .925 sterling silver, sweet rose gold, and rich 14K gold plated. The chain itself is adjustable and can be worn at 15 in (37.5 cm), 15.8 in (40 cm), 16.5 in (42.5 cm) and 17.7 in (45 cm). I got this necklace with my kids' name on it. The pendants are so cute. Love it very much. It's a perfect gift for mom. I am so happy to see the smile on my mom's face when she opens the box. It's a cute necklace. My friends ask me where I get it. Loveeee it. Such a cute piece. Now it's my favourite necklace. I have to say it is so lovely and meaningful. Everyone loves it. I got this necklace just in time for my mom's birthday. It is a cute gift and my mom loves it very much. Satisfied with the time taken to be delivered. The necklace is also very pretty !